SKLO, also known as Sam Lo, is an artist out of Singapore who claims to comment on the world around her through the cues of everyday life. But of course, you say, seeing as we all have days filled with rabid stormtrooper attacks that ultimately reveal to be none other than Chief Chirpa. Come to think of it, the clone faces behind those helmets have always been somewhat of a mystery. 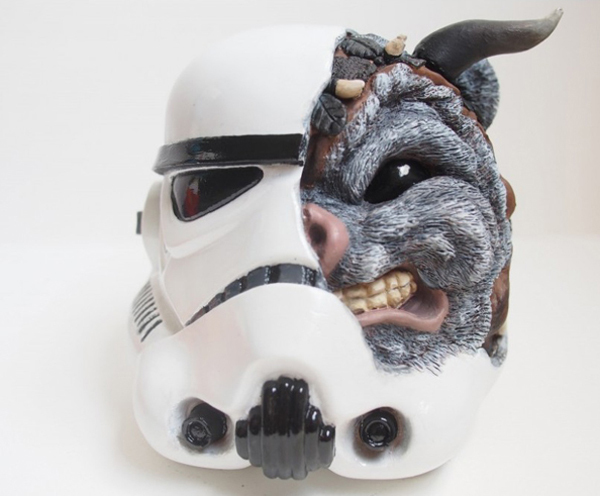 With the collaborative help of Flabslab, a production house also out of Singapore with a soft spot for Star Wars themes, comes the sculptor’s second resin-rendering of an Ewok trooper: Chief Chirpa in a stormtrooper’s helmet. “The Uprising: An Original Abomination” is a highly limited edition of only 15 pieces, each individually numbered and signed, and standing at 15cm x 14cm x 13cm. Get your own sculpture/abomination for $300.